I love anything with a scarf print and thought this outfit looked a little vintage chic...happy Friday! lovely look. Really love your accessories here too! You are gorgeous! Your style inspires me so much! How darling you look!! Love it! 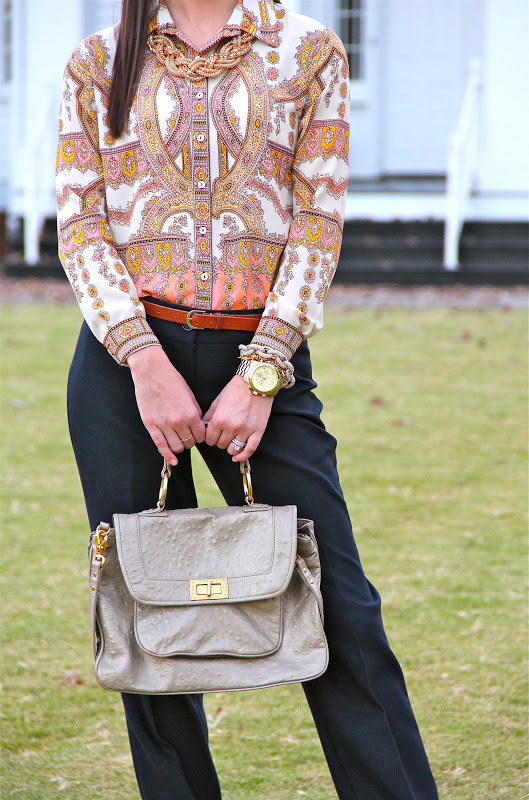 Loving that scarf-print blouse & how you styled it so sophisticated...great work look! Great look! Love the jewelry! You have great style!! in love with your shirt! so pretty! Love this look! The shirt has such a gorgeous print! that top is beautiful!! and I love all your bracelets!! Gorgeous top!! So chic!! I want this whole outfit! Oh my gosh this whole outfit is chic to the core! I love a vinatge looking outfit as well! Great shirt. Would love your thoughts on my latest post! very nice. You look well put together and pretty. That is a fabulous top and I love it with your straight hair! 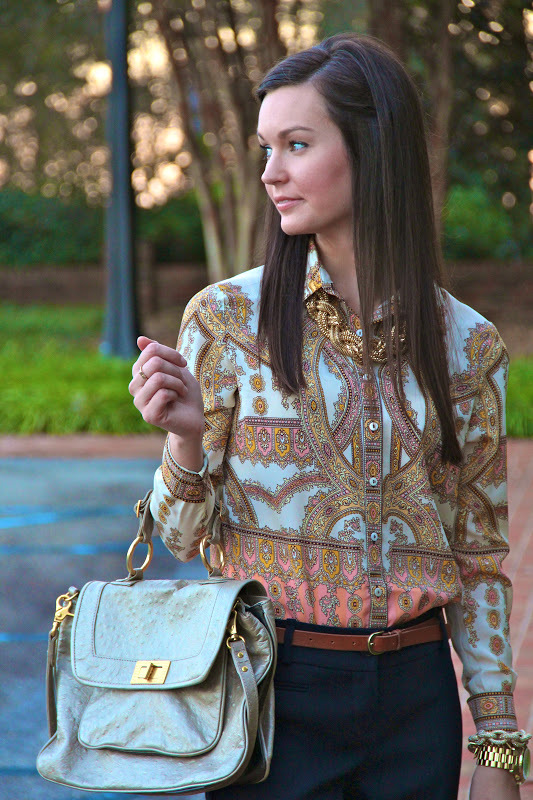 Loving the arm party and that blouse is gorgeous. I seriously want to raid your closet! That blouse is simply gorgeous! check my blog if you want and maybe we could follow each other!! there is a SPONSOR opportunity too! 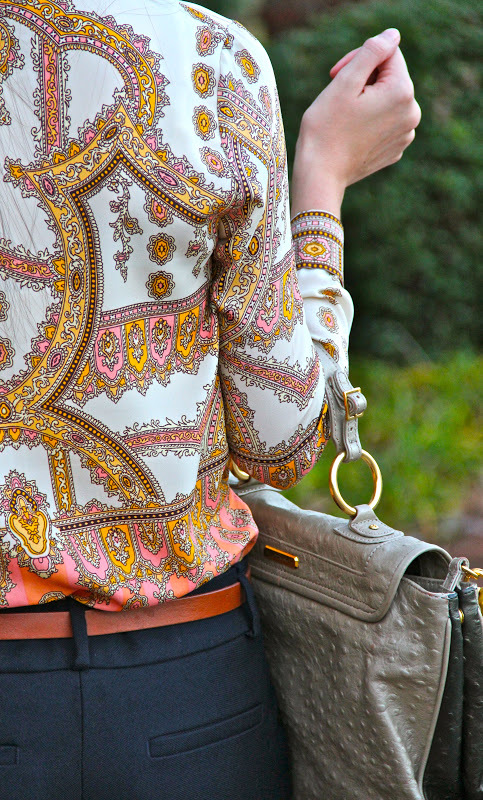 The print on your blouse is gorgeous! I love scarf print! I have a similar top from Zara that I wear to work WAY too often, but I love it :) Have a great weekend! Love that top! You always have the cutest posts! You look amazing. So nice details. Great and nice blog. Classy look- beautiful print! Loving the chunky gold link jewelry with this look! Great top and I love all the jewelry! Hello I'm a new follower via e-mail. The watch caught my immediate attention I love it to pieces. I love this, it is so pretty and refreshing! Love the bracelets and the watch too! Love the color & print of this top. So pretty. Have a great weekend! I totally love your style! Your accessories alone are awesome :) the top makes your eyes pop, love this! Love the blouse and accessories... I've said it already many times, but I think your photography is awesome. Wow, this shirt is awesome! I like also your accessories! 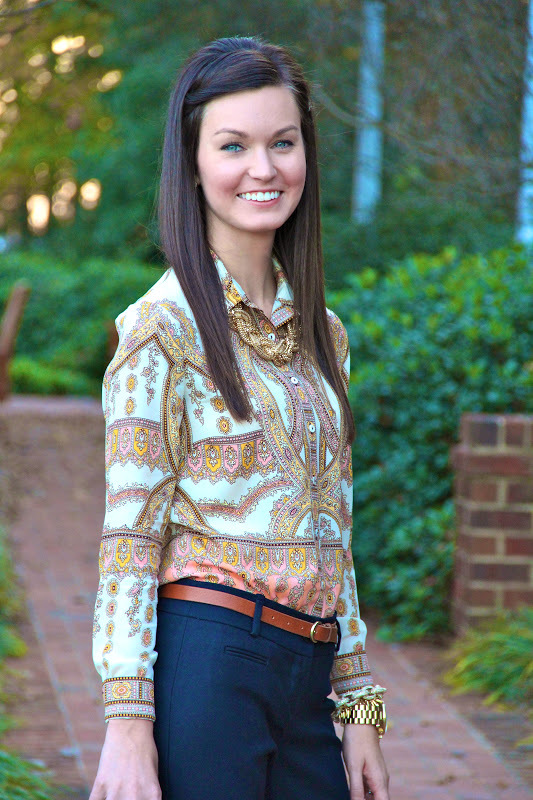 This is a gorgeous blouse; thanks for sharing!! Love your style- I am a new follower! Vintage chic for sure! What a lovely outfit Megan! !